Can the art of teaching art be exhibited? No, but people keep trying. Can art be taught? That question isn’t as old or as hoary as one might imagine. For many centuries, artists were taught, either through a studio apprenticeship or, later, in a formal academy. It only became possible to think of art as something different in the 19th century, when the old system fell apart and it seemed conceivable that anyone could be an artist. But very few people were. Perhaps being an artist was the result of some peculiar inner drive or necessity, some genius that burned in certain kinds of people—something they were born with rather than something that they learned. The question has by now fueled two centuries’ worth of bar banter, family quarrels, and panel discussions. What keeps the conversation going is that many of the people who say that art can’t be taught still make their living by teaching it. Teaching does have its own rewards, and so does trying to learn, whether the learning “takes” or not. A related question is easier to answer: Can the art of teaching art be exhibited? No, but people keep trying. The ambitious show “Leap Before You Look: Black Mountain College 1933–1957,” at the Institute of Contemporary Art in Boston, is the latest such effort. (It will be on view at the Hammer Museum at the University of California, Los Angeles, from February 21 to May 15, and then at the Wexner Center for the Arts at Ohio State University in Columbus from September 17 to January 1, 2017. A handsome catalog is available from Yale University Press.) In fact, Black Mountain exhibitions have become a genre unto themselves. “Leap Before You Look,” curated by Helen Molesworth, formerly of the ICA/Boston and now at the Museum of Contemporary Art in Los Angeles, is the fourth that I know of. The first, which I saw in 2002, was “Black Mountain College: Una Aventura Americana,” curated by Vincent Katz, at the Museo Nacional Centro de Arte Reina Sofía in Madrid. Then came “Starting at Zero: Black Mountain College 1933–1957,” curated by Caroline Collier and Michael Harrison, at the Arnolfini in Bristol, England, and Kettle’s Yard, University of Cambridge, in 2005 and 2006. And last summer, I paid a visit to the Hamburger Bahnhof Museum für Gegenwart in Berlin, which mounted “Black Mountain: An Interdisciplinary Experiment 1933–1957,” curated by Eugen Blume and Gabriele Knapstein. Why the recurring preoccupation with a short-lived, unaccredited school at the back of beyond, which never had enough students to pay its way? It could be the school’s believe-it-or-not story and how, the more you learn about it, the more unlikely it seems. The tale begins in 1933, when an unorthodox, arrogant classics professor named John Andrew Rice and several of his colleagues were purged from Rollins College in Florida. A number of their fellow professors resigned in protest, and some students withdrew as well. Bent on starting a college of their own, they found a complex of buildings for rent near Asheville, North Carolina, and some start-up money—but not much. At first, the faculty worked without salaries, but at least they owned the joint: The papers of incorporation specified that “the sole membership of the corporation” would be “the whole body of the faculty.” In other words, there was no board of directors and no non-teaching administration either, so the instructors had no other masters than themselves. There was splendor and misery at Black Mountain, which was run according to the will of its teachers and, to a great extent, its students. The faculty believed that the curriculum should reflect what the students needed or desired to learn. This principle runs contrary not only to the present conception of the student as a consumer or client who is to be supplied with certain knowledge, but also to the designs of the conservative governors of North Carolina, Wisconsin, and other states, who believe that they should have the final say over what’s being taught and who’s doing the teaching at their state colleges and universities. At Black Mountain, teachers and students committed themselves to shared undertakings, the educational equivalent of socialism: from each according to his abilities, to each according to his needs. There’s some irony in the fact that two of the three stops on the “Leap Before You Look” tour are university campuses. Between Black Mountain and most of today’s universities (and art schools), there lies an unbridgeable gap between teachers willing and able to make a full commitment to students who would do the same, and institutions staffed by poorly paid adjuncts who’d be mad to invest any more care in their fleeting charges than Uber drivers do in their next fare. It’s the gap between a society of members who take responsibility for the whole, and bloated administrations and boards that imagine schools can be run like corporations. It’s the gap between the desire to live and work together as a community day and night, and the fantasy that massive open online courses will allow fewer teachers to impart information to ever more numerous and ever more atomized recipients. It’s the gap between a desire for equality, on the one hand, and the bottom line of profit-making corporations, on the other. Art education too has become a casualty of the corporatization of higher learning, as shown by the recent disasters at Cooper Union in New York City and the University of Southern California in Los Angeles. The Cooper Union for the Advancement of Science and Art, as it’s officially known, is a small but renowned school of architecture, engineering, and art that, from its founding in 1859 until 2013, offered a full-tuition scholarship to every student—a free education at the highest level. Its alumni include the likes of Lee Krasner, Eva Hesse, and Alex Katz. But a new president’s desire to make his mark by spending hundreds of millions of dollars on new buildings—over the objections of the faculty—­ultimately led the school to near bankruptcy and the abrogation of Peter Cooper’s desire that the school he founded be “open and free to all.” And what about the board, whose responsibility it was to protect Cooper’s vision? As Fusion’s Felix Salmon tartly observed in an excellent summary of the tragedy: “Faced with a loan whose terms were unacceptable on multiple levels, the Cooper Union board did exactly what you would expect them to do. They agreed to everything.” Although the state attorney general’s office has intervened and called for a return “to a sustainable, full tuition scholarship model,” it’s hard to see how that will ever happen. Given this sort of educational malpractice, the fascination with Black Mountain as an alternative is easy to understand. It’s no accident that Molesworth, the curator of “Leap Before You Look,” also chaired a roundtable discussion on Cooper, Roski, and art school in general for last October’s Artforum. At its best, her show conveys an exhilarating sense of the school as an educational utopia in which one might have helped to build a new seminar room in the morning, thrown pots in the afternoon, studied history in the evening, and criticized after dinner, just as one pleased, without ever becoming a builder, potter, historian, or critic. Black Mountain wasn’t an art school, but rather a school where art was central, so the exhibition isn’t mainly of works, though many of those on display are excellent. There’s an extraordinary canvas by Cy Twombly, painted when he was a 23-year-old student, which shows that by 1951 he had learned enough from elders like Franz Kline and Robert Motherwell for his work to surpass theirs in visceral intensity. Also entrancing is Ruth Asawa’s hanging sculpture of organic forms in woven wire. But seeing and hearing works created by those who taught at Black Mountain—whether famous (notably Josef Albers, who was Black Mountain’s leading figure from the mid-1930s until 1949, and his wife Anni, a renowned weaver and fabric designer, as well as John Cage and R. Buckminster Fuller, among others) or more or less forgotten (Leo Amino, Mary Callery, José de Creeft, Joseph Fiore)—will never reveal much about what it was like to study there. Nor will seeing the works of their students, even those who became as renowned as Robert Rauschenberg or Kenneth Noland, or “artist’s artists” like Ray Johnson and Pat Passlof, or even simply figures who seem to have made a profound impression on the life of the school but less so on the wider world (for instance, Dan Rice, who arrived at Black Mountain intending to study musical composition but ended up becoming an Abstract Expressionist painter). Photography plays a more interesting role in the exhibition than painting or sculpture, ceramics or weaving, because of its dual nature as document and autonomous art. Even many photographs that were clearly intended as formal exercises, like the architectural studies by Hazel Larsen Archer and Jacqueline Gourevitch, or Gourevitch’s image of chairs in a seminar room, reveal something about how the college looked, helping us project ourselves back into a vanished time. And all the images of dancers! The body’s thrusts and pivots, the structural alphabet of the dance, become metaphors for the photographer’s breakdown of the visual field into active parts—whether in an image by Larsen in which Merce Cunningham seems to be distending toward infinity as his head and arm glide up and out of the frame while his feet stretch back toward an earth that will no longer touch them, or in some pictures by Stan VanDerBeek that turn a dancer’s body into an anonymous silhouette vibrating in time as much as in space. To the extent that “Leap Before You Look” succeeds in evoking some of the collective weirdness and joy of Black Mountain, it’s probably through the film clips of dance performances by Cunningham and Katherine Litz. Most surprising, perhaps, are some portraits of students and faculty done up in fantastical costumes and makeup for a 1940 Valentine’s Day ball. Shot with color slide film—and more evocative in their artifice than your average Cindy Sherman—they’re the work of Josef Albers; I assume their evocative red-and-brown tonality is a result of deterioration of the original Kodachrome slides (the cyan dye would have faded at a faster rate than the magenta), but it only adds to the pictures’ atmosphere. It’s a chemical version of the redshift that, as physicists tell us, occurs when objects move away from us in space and time. Tension was rife among the faculty; dominating personalities were feared as potential dictators. Personal differences tended to escalate into vaguely defined but highly dramatic conflicts of educational philosophy or political position. For instance, the arrival in 1942 of the abrasive young British critic and translator Eric Bentley led to a panic that he was spreading communism among the students. And concerns about sexual mores and personal appearance could descend to levels that now seem ridiculous. 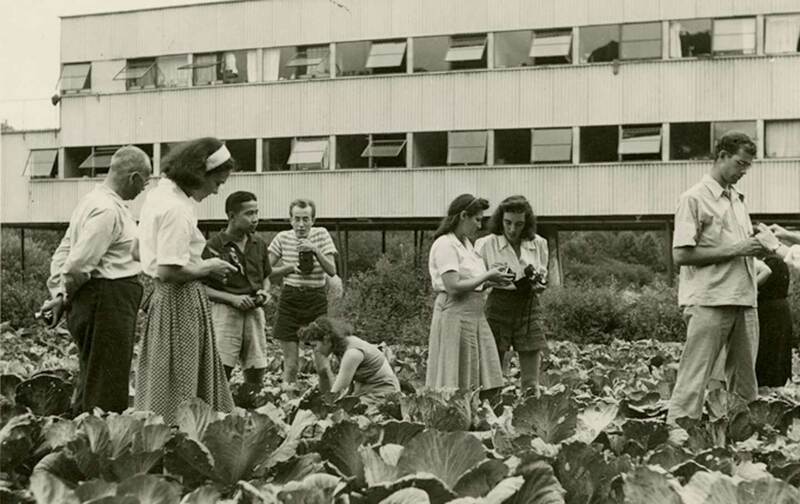 “The debate on how short girls’ shorts should be, whether bare feet should be allowed in the dining hall, and whether ‘seminude’ sunbathing was appropriate in front of the studies building, were perennials at Black Mountain,” according to Duberman. Of course, all of this has to be taken in context: As a liberal enclave in the conservative South, the college felt constantly compelled to keep up a show of respectability; there could be real consequences if the proprieties were ignored, as when a couple of female students who’d gone hitchhiking were arrested as prostitutes. An aversion to the risk of discord with the college’s neighbors also delayed the hiring of black faculty members and the admission of black students until 1945, although some members of the college had been agitating for integration for years. In the end, Black Mountain found it almost impossible to attract black applicants. The college went through a whole series of feuds, purges, and changes of leadership in its brief lifetime: John Andrew Rice, the visionary who’d started it all, was ousted after seven years. Yet the exploratory impulse was never snuffed out. In fact, it could be argued that Black Mountain’s most incandescent period was the last one, from 1951 until it closed six years later, when the poet Charles Olson was the school’s dominant personality. Olson considered that he was returning the college to something like Rice’s original radical vision for it after a relatively more conservative interregnum. Olson’s Black Mountain was, of course, more literary a place than it had ever been, and even more determinedly experimental. He seems not to have concerned himself with the length of young women’s shorts. Black Mountain’s founder had in his own way anticipated the Maoist doctrine of continuous revolution. “At one time Rice said he thought the college should disperse every ten years into smaller units,” recalled M.C. Richards, the English professor turned potter who’d been instrumental in bringing Olson to the campus. “This was to avoid too much stability. It was to be faithful to the chaos out of which creativity constellates.” No one was better at cultivating chaos and spangling the atmosphere with its constellations than Olson. Who else would have thought of suggesting to a fellow poet, Robert Creeley, that he fill in as a teacher of biology? When Creeley pointed out that he’d never studied the subject, even in high school, Olson “said, ‘Terrific, you can learn something,’” Creeley recalled. “Subsequently, I realized that teaching is teaching. It has, paradoxically, nothing to do with the subject.” In other words, true learning, as described by Jacques Rancière in The Ignorant Schoolmaster, is fostered by teaching what one does not know. As Rancière wrote, this kind of education can never be institutionalized; “it is the natural method of the human mind,” yet everything works against it. No wonder Black Mountain could never come to terms with the outside world or itself. Robert Duncan, in his extraordinary poem “The Song of the Border-Guard”—shown in “Leap Before You Look” as a broadside accompanied by a Twombly linocut—imagines “a barbarian host at the border-line of sense.” Which side of the border was Black Mountain on? Were its denizens the barbarians readying themselves to overcome the common sense of Eisenhower’s America, or were they guardians of a deeper sense of life and learning against the yahoo horde surrounding them? No matter. “The enamourd guards desert their posts / harkening to the lion-smell of a poem / that rings in their ears.” And the poem of Black Mountain still rings in ours.